Whenever you’re confused by something Trump is doing, remember: he’s less a politician than a propagandist. Don’t look to the policy for the logic driving his actions — look at the pictures. This week, progressives are confused and outraged by the imagery coming out of Texas showing immigrant children being separated from their parents and held in detention centers. Babies crying, chain-link fence, mothers restrained by ICE agents, teens warehoused in decommissioned Walmarts. Surely this is enough to bring down the Trump administration, or lead evangelicals and others to appreciate the hard-heartedness of his treatment of the huddled masses. But despite the outrage, despite the round-the-clock coverage, despite the YouTube videos, and despite the rush of the horrified, truth-based media to the scene of the Mexican border — or even because of it — Trump’s propaganda is coming through loud and clear: America is being invaded by something less than human beings. 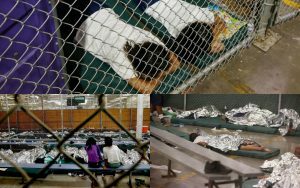 On the surface level, at least to those already sympathetic to Trump, the immigrant children are not victims of the US Department of Homeland Security but victims of their own parents. Smuggle your kid over an international border into a country where you’re not welcome, and guess what? You’re going to risk being separated from your kid. Like driving drunk, or leaving your kid in the parking lot while you do grocery shopping, illegal immigration puts one’s children at risk. The images of weeping children are meant as warnings to those thinking of setting out tomorrow or next week or next month for a stealthy border crossing into America: the risks are greater. And Trump manages to generate all this fear and deterrence without shooting or electrocuting anybody. Better yet, he can blame the democrats for not having made a deal with him on the Dream Act. You want this horror show to stop? Accept my terms for a wall. But to understand the longterm propaganda strategy, we have to focus less on the words than the pictures. It’s not about who is to blame for what. It’s about recasting the immigrants as refugees, and refugees as animals, prisoners, vermin, and potential terrorists. Photos of teen boys in detention centers, sectioned off by chainlink fence, are meant to evoke reform schools or prison cells. These are the would-be members of the notorious MS-13 gang. Pictures of children of color, huddled together under rescue blankets, recall those of Syrian refugees fleeing war for the relative safety of Europe. He’s not just calling them “poisonous snakes” or “animals,” but creating a situation that — however painful to watch — slowly recontextualizes human beings from America’s south as animals. With enough time, our brains reconcile the images with an imaginary reality: if these people are in cages like animals, then they must be animals. It’s the same strategy used to undermine the humanity of immigrants for ages, whether it’s the media treatment of Albanians fleeing to Italy in the 1990’s, made to appear like an invading army of rodents, or the Biblical Pharaoh framing his Israelite slaves as fast-replicating insects. It plays to the darkest, fear-based construction of our primitive psyche: us or them. Forget the reality — that Mexicans are actually emigrating from the US back to Mexico: there’s a net decrease. That more immigrants come from China and India than the south. The only way to understand the Trump administration’s proposed wall is as a safety play for global warming. Instead of admitting there’s an environmental crisis underway and reducing carbon emissions, just accept the inevitable climate crisis, and barricade the nation from the inevitable flow of refugees from the south. Whatever we’re doing now is simply priming the American public for the inhumanity to come. The one thing this photographic strategy doesn’t take into account is the sound. Photography emphasizes distance and objectivity. It’s evidence. Human faces shrunk down to the size of thumbprints, frozen in time. The sounds of the crying children reach a different part of our psyche. The cries resonate in our bodies as surely as if the suffering children were in the same room. Sound is intimate. That’s why I do radio and podcast: the sound connects us, retrieving a pre-internet, pre-printing press, pre-scribal sense of community. The net has encouraged us to use our eyes to understand the world. Pictures and text. Memes. That may be great to promote ridicule and provoke fear. But it’s time to get beyond the images we’re fed before we accept the fake news they’re trying to disseminate. If it takes the sounds of crying children to wake us up from this nightmare of nativist superiority, so be it. This has been adapted from today’s monologue on Douglas Rushkoff’s podcast, Team Human. Previous Post: Team Human: New Episodes and Live Show!